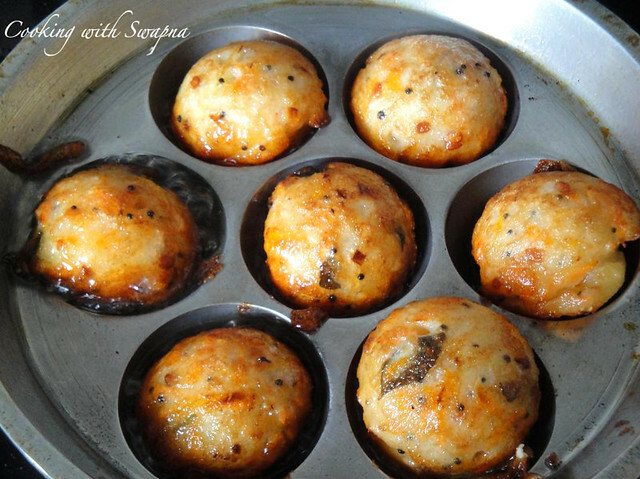 When I say chettinad cuisine, the first dish that strike my mind is the "Kara kuzhi paniyaram". Chettinad dishes are popular for its spicy flavour. Paniyaram can be made either sweet or savory. kuzhi paniyaram, well-spiced, fried a deep golden brown, and served with sambar and chutney (coconut or a red) is an absolute treat. Succulent and spicy, it’s a great snack — with tea, coffee — or even as a starter, served on a platter, as the prelude to a sophisticated dinner. Kuzhi paniyaram can be made easily with the leftover idli/dosa mavu by adding little ingredients & it finally looks like a round golf ball in shape. Try this chettinadu special paniyaram & u will love it!!! Finely chop Onion, small onion, Green chili, Curry leaves and Coriander leaves. Fry the grated coconut in a tsp of oil & set aside. Heat Oil in a pan, add Mustard seeds, cumin seeds and Channa dal, fry till Channa dal turns into light brown in color. Add Onion, small onion, Green chili, carrot, ginger, hing and Curry leaves, fry till the Onion becomes light brown color. Allow the fried items to cool. Add these fried items, Salt, grated coconut and Coriander leaves to the Idly batter and mix well. Allow it to cook for few minutes. Flip it over to cook the other side. Serve hot kara paniyaram with coconut chutney. Enjoy!!! 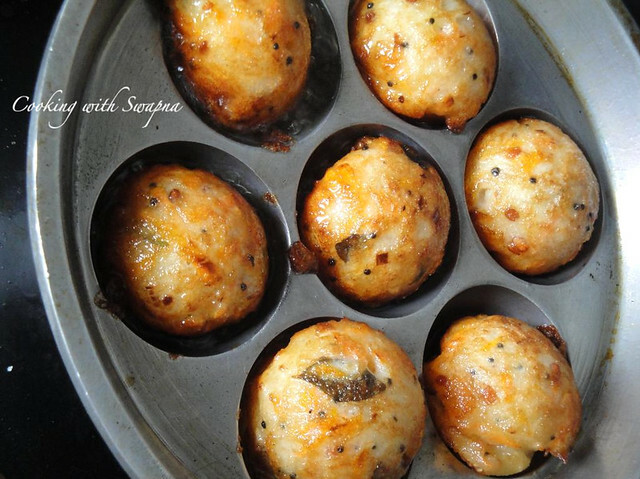 Kuzhi Paniyaram looks so yummy! It's one of my favorite dishes. i make this too and love it..looks yummy..